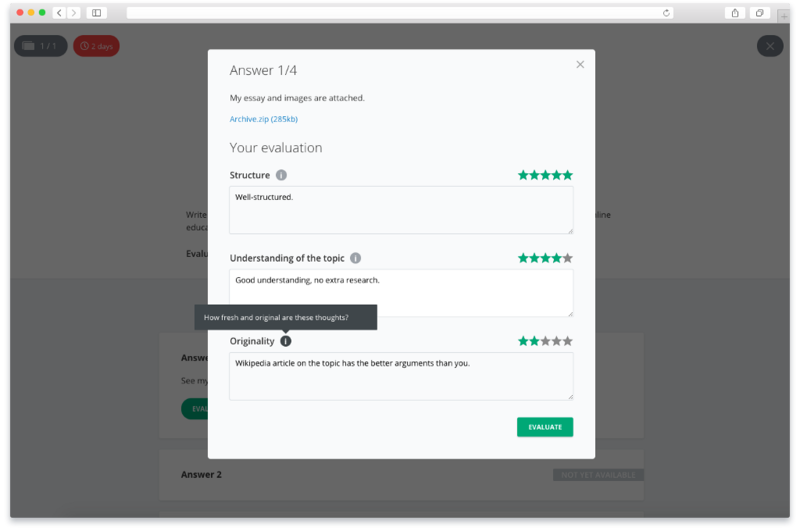 In order to add an Expert-graded Assessment to your course, simply drag the corresponding element onto the course schema panel. Title - the title of the assignment task that will appear on the course schema, in email notifications, and in various reports. Annotation - a brief summary of the assignment that also appears in email notifications. Assignment text - the description of the task, which will be displayed to students once they reach the Expert-graded assessment element in the course. Attach file - files containing additional material can be attached to the assignments. Completing period - how much time the student has to complete the assessment. The timer begins to count down once he or she presses the "Start" button. If the assignment is not submitted on time, it is automatically marked as "failed". The format of assessment - the way you would like the work to be graded (either Pass/Fail or a score from 1 to 100). Once you finish customizing the element, you can connect it to other course elements using Pass and Fail connectors, and also preview how the assignment would look from the point of view of a student. Unless the "Do not accept appeal" checkbox is checked, the student will be able to make another pass at completing the assignment by uploading new files to be checked and graded. 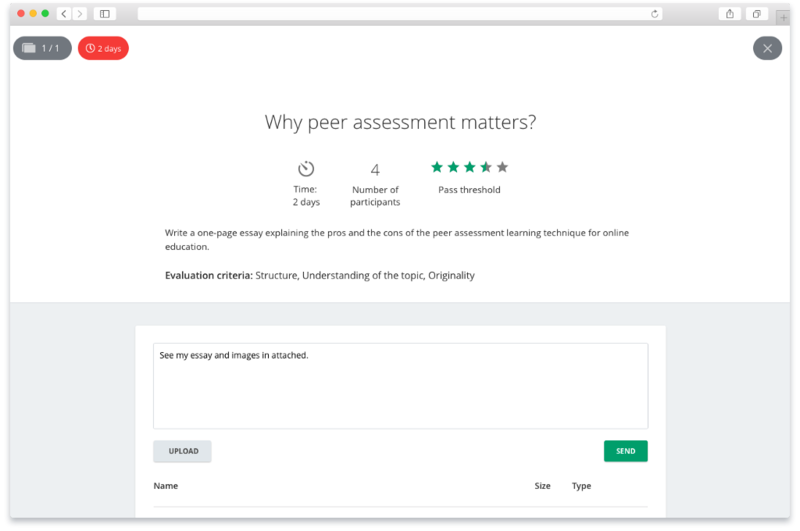 In order to add a Peer-graded Assessment to your course, simply drag the corresponding element onto the course schema panel. If your course is too massive to be handled by one teacher, you can invite the Experts. Experts will receive the email notifications for every submitted assignment. Experts can rate any assignment that requires an evaluation. Time to completion - how much time the student has to complete the assessment. The timer begins to count down once he or she presses the "Start" button. If the assignment is not submitted on time, it is automatically marked as "failed". After the students receive the feedback from the peers, they will see the results screen, where they can take an extra attempt if required. After they pass the threshold or run out of the attempts, the system will move them to the next slide of the course map. 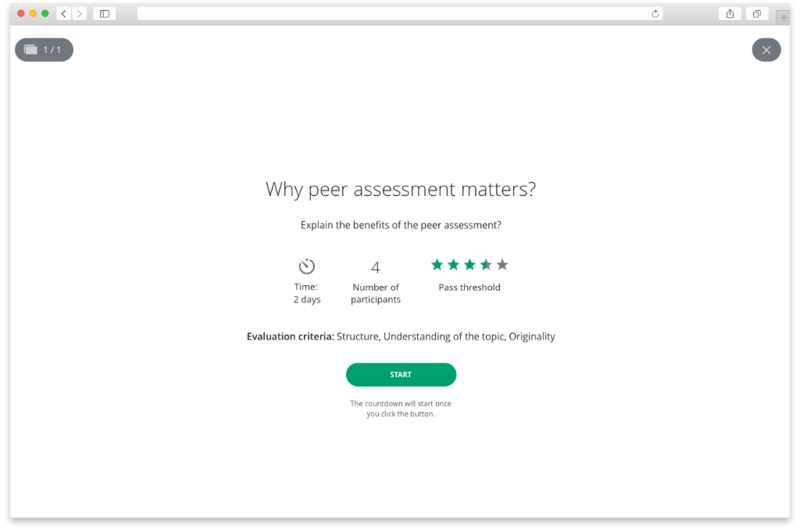 Before adding the peer-assessment, we highly recommend doing a test run. It will help you to find the best objectives and threshold values for your students and your assessments.